How to evaluate the mental state, and in particular the stress and the cognitive load of a soldier who is learning how to deal with a tank turret on a simulator, or that of a pilot during an air combat training? What if we could capture, and interpret, his brainwaves, in order to provide the instructor an indication allowing him to adapt and personalise the training? These are the aims of COGNISIM, an ambitious project that the Direction générale de l’armement (DGA) has decided to support thanks to the RAPID (Régime d’APpui à l’Innovation Duale*, dual innovation support scheme). COGNISIM aims at developing an evaluation of the cognitive load and of the stress, starting from the brain activity real time analysis, which should be implemented in training simulators in order to adjust the simulation level to the status of the trainee. Training becomes then personalised, adapted to strong and weak points of each trainee, as the instructor is equipped with an objective tool form optimising the formation. The COGNISIM project puts together, for a 36 months timeframe, two SMEs, one academic partner, and a big industrial group. Physip, the project leader, is responsible for the real time automatic identification of mental load and stress markers, based upon the brain activity by electroencephalogram (EEG), using a reduced number of sensors. 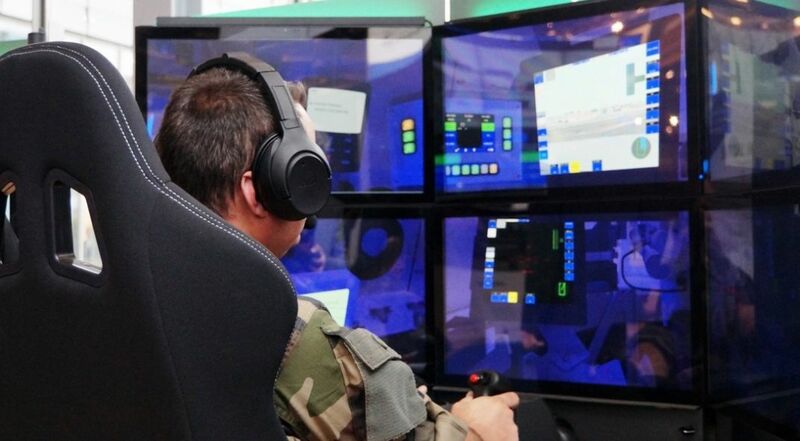 The Agueris company, a subsidiary of the CMI Defence group, integrates the COGNISIM device in a turret crew-training simulator and puts the trainees into the scenario. The CRNL (Centre de Recherche en Neurosciences de Lyon, Neurosciences Research Centre of Lyon) brings the scientific validation methods of an innovative approach to the mental load, based on a reduced number of sensors. Finally Faurecia provides its technological expertise in the automotive domain and opens the thinking on possible applications in a context where the industry explorers the feasibility of brain activity exploration. In the military environment, as well as in civil applications, COGNISIM will allow to exploit the information concerning the status of the trainee in order to adapt the simulation level to optimise formation and training. Simulation training is the first use case, in close cooperation with operational experts belonging to the armed forces. Other applications will soon be considered, such as the monitoring while driving or piloting, in order to identify situations that generate cognitive load or stress.